Done with 90% watercolor, 6% Acrylic, 3%colored pencil, and 1% why did I do this again? What about one for her mother, Queen Serenity, too? I heard about this back in may. I applied to be an artist to draw up some artwork for the art auction, but probably wont hear back till the end of the month. Well, there was that, and I simply thought that the picture was nice. Maybe even a good idea for a future picture, if your interested; because it looks like the Moon Kingdom's Castle's/Palace's reflection in water, so, strictly-speaking, no actual straight straight-lines would need to be drawn. Sorry! I've been MIA lately. Oh god work after christmas is rather brutal! Thought you might like it. It's maybe an idea for a 'Goddess Senshi' series. What do you think? Have you ever thought about a landscape picture of the Moon Kingdom's Castle, from any adaptation (manga, Original Anime, PGSM live-action, Reboot Anime; moon-shadow-1985.deviantart.co… & moon-shadow-1985.deviantart.co… )? It's just that I feel that an image of the castle, as the subject of the image, rather than as the background, would be wonderful. That it would come out just beautifully. Yup! 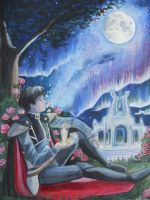 And theres also one of Endymion longing for his princess on the moon! I love your fireworks and the picture is gorgeous. So beautiful. I love it. So I wouldnt have to deal with any water in front. I thought the Original Anime and Reboot Anime have been Illustrated enough on DA, so I went with the Manga version. Ah. Always good to stick with classics. (thumbs-up). Yay! Thanks for the lovely comment! This is so beautiful! Especially the night sky looks amazing here. I know what you mean! I'm still pretty proud of those fireworks.